The various issues encountered during the 2017 National Elections prompted the Government to address these concerns by directing the Constitutional and Law Reform Commission (CLRC) as the lead state agency together with other key state agencies, to inquire into the workings of the Organic Law on National and Local-level Government Elections and related laws and systems...... The IPPCC is a key partner with the CLRC and forms part of the External Secretariat who were tasked through a Constitutional Directive to undertake the review of the Organic Law on Elections and related electoral laws and systems. The work of the Review commenced with its official launching on 12th June 2018 in Port Moresby by the Prime Minister, Honorable Peter O’Neil. The review is guided by thirteen (13) Terms of References (ToR) which forms the basis of enquiry through a nation-wide consultation. The 13 ToRs include; The Electoral System (ToR 1), The Voting System (ToR 2), The Electoral Boundaries (ToR 3), Women and Special Interest Representation in Parliament (ToR 4), Nomination Fees (ToR 5), Eligibility for Nomination (ToR 6), Election Petitions Filing Fees and Periods of Filing (Tor 7), Voter Identification System (ToR 8), Local-level Government Elections (ToR 9), Electoral Offences (ToR 10), The Powers, Functions and Composition of Electoral Commissioners (ToR 11), Decentralization of Election Responsibilities (ToR 12) and Any other things you wish to say regarding Elections and Election Laws (ToR 13). All provinces under NGI region, Momase region, parts of Highlands region (Western Highlands, Eastern Highlands, Chimbu and Jiwaka), Central and Gulf provinces were visited. The remaining provinces for Southern region and Highlands region will complete the last phase of the nation-wide consultations in the last week of November 2018. Over 23 written submissions were received while more than 2000 questionnaires were collected from tertiary institutions, secondary schools and participants during the consultations. The level of participation was good in all four Highlands provinces. For the NGI provinces the level of participation was generally good as well. 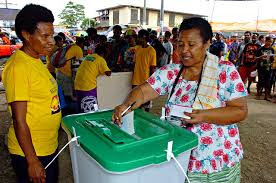 However in Morobe province the level of participation was very disappointing due to poor turnout from the public, political leaders and provincial administration officials. The level of participation in Central and Gulf provinces was also good. In terms of the general reactions towards the consultations, the people in the provinces were generally happy to give their views. They were quite happy to be given the opportunity to have their say however, people expressed concerns that if the Government was serious about the review, the recommendations of the report must be implemented before 2022 National elections. In terms of the voting system, LPV to continue for another two or three elections to allow the system to mature before changes can be made. Others wanted First-Past-the-Post (FPTP) because it is simple and easy to use as it gives only one leader. The period of polling would depend very much on the topography and accessibility of polling location and venue. Urban areas should be allocated one day of polling while geographically challenged areas should consist of 7 days of polling. If electronic system of voting is to be used, then the period of polling and counting should be reduced to 2 – 3 days. The issue of electoral boundaries attracted a lot of attention with many people arguing for electorates to be split based on cultural and linguistic grounds. Electoral boundaries to be divided on the basis of access to goods and services delivery, land and sea area, and population size. Generally most views raised favored more women in parliament, but the only issue was how they would get into parliament. Some speakers wanted women to be elected through reserved seats, whilst others wanted women to be voted through the formal election process. There has to be a stringent criteria for candidates to be eligible to contest the elections which should be based on medical grounds; age and experience where the minimum age to contest the elections should be between 30 and 35 years of age; have at least five years of work experience in the public service; and a candidate’s education qualification should be tertiary level preferably a degree certificate. Support was given for an effective voter identification system to address and reduce electoral fraud such as double voting and underage voting by using driver’s licenses, NID cards, and passports during polling. LLG elections to be conducted before the National Elections to allow the electoral roll to be used as a roll cleansing exercise during the LLG elections to improve roll accuracy before using it in the National elections. There should be 4 Regional Electoral Commissioners and one Chief Electoral Commissioner whilst others wanted two Electoral Commissioners to allow for a balance and avoid bias in terms of decision making during the elections. The responsibility of running the LLG elections and electoral roll update must be given to the provincial administration with adequate funding support and electoral training from PNGEC and the National Government. Make it compulsory for all candidates to be party endorsed in order to make independent candidates obsolete, allowing IPPCC to take responsibility in vetting and scrutinizing all party endorsed candidates before eligibility is granted to contest the elections, to achieve accountability and strengthen political parties as important political institutions. (ToR 13). Speakers wanted a Bi-cameral House to allow for Bills to be properly scrutinized and to strengthen the legislative process to achieve effective oversight in parliament (ToR 13). Speakers wanted the Prime Minister to serve for only two terms and be elected directly by the people. Also the PM’s seat should be reserved for indigenous Papua New Guineans (ToR 13). A preliminary report was submitted to Government to inform them about the expenditure of the Review work and brief findings after a month’s period of consultations. The final report of the Review work is expected to be submitted to Government in the second quarter of 2019.